South Pointe Middle School collected canned food items for area needy. Boxes and bags of canned foods will be delivered to area needy. South Pointe Middle School hosted a canned food drive for area needy in December. Donations from the annual event, sponsored by Leadership students, will be delivered to several local families, the Walnut Food Bank, and a sponsored family from the non-profit Steven’s Hope, according to advisor Jamie Kervliet. 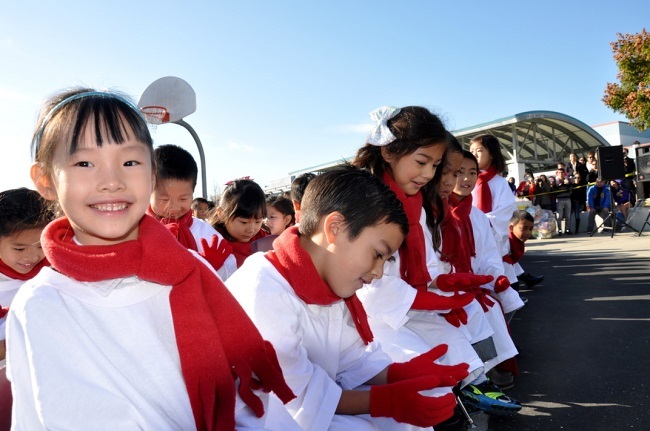 The students hope their simple gifts will make a difference during the holiday season. “They don’t have a lot of food on their table,” stated 8th grader Melody Lee. This makes me appreciate all that we have,” added Charlene Hao. 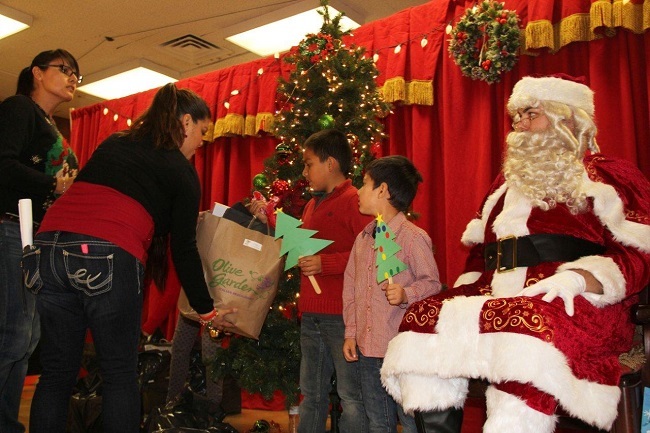 Westhoff Elementary presented its annual Spark of Love toy drive and holiday extravaganza. Students filled boxes with hundreds of new toys for needy children. “For 22 years we’ve been making the lives of other children really special at this time of year,” said Principal Denise Rendon. The Spark of Love toy drive is co-sponsored by Southland Firefighters and KABC7. Firefighters from Walnut Station #146 would later deliver the donations to needy children in the Los Angeles area. Westhoff students loved the surprise snow delivered by Santa and his elves during the staff finale! “This holiday spirit restores the true meaning of Christmas. It shows us that everyone here has a chance to give to the less fortunate. And you’ve all truly done that here,” commented Captain Russell Blackschleger. 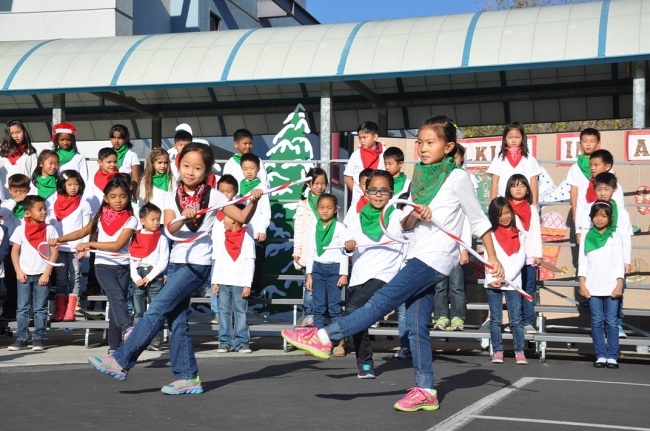 Fifth graders showed their gymnastic, roller blade, dance, and baton talents during the high-energy “Big Time Rush.” Westhoff staff members performed a holiday line dance with Santa and his elves during the Walking in a Winter Wonderland finale. 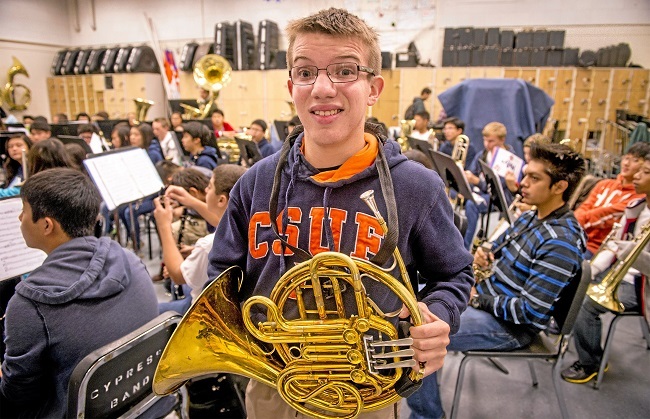 Brent Dillard can’t wait to march down Colorado Boulevard on New Year’s Day with the Cypress High School Band. The 15-year-old plans to walk the whole 5.5 mile distance, even though he suffers from cerebral palsy. Dillard has always wanted to follow in this father’s footsteps by joining the Cypress Centurion Imperial Brigade. A grand name for a 233-member band with a “big” sound. “My dad played the clarinet and tuba in the marching band,” Dillard noted. The teen chose the French horn for its rich sound. And he can play it with his one good hand, using the other to support the bell of the brass instrument. The band took the field after school last week to rehearse for the grand parade. Under a cold threatening gray sky, Quirion put his centurions through their paces. “Beginning Saturday, we start our marathon rehearsals, practicing from 8 a.m. to 5 p.m. every day,” said the enthusiastic band leader, who marched in the 101st Tournament of Roses Parade as a trumpet player with the Santa Ana Winds Youth Band. He was 16 years old at the time, but he has always remembered the experience, and now he wants to share it with his high school students. Last Saturday more than 200 students and members from the Walnut Valley Rotary gathered at Alvarado Intermediate to assemble holiday baskets for families in need in the Rowland Unified School District. Students from Interact clubs at Rowland High School, Walnut High School, ASB students from Nogales and Santana High Schools, along with college students involved with Rotary from Cal Poly Pomona and Mt. 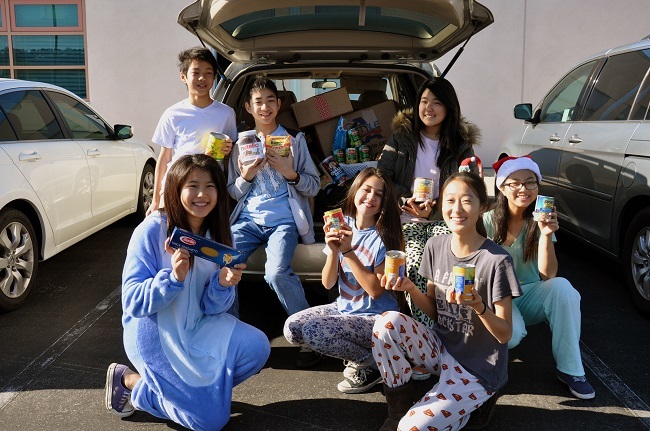 SAC gathered at 7 a.m. to assemble the 11,567 cans of food and 250 turkeys that were donated. 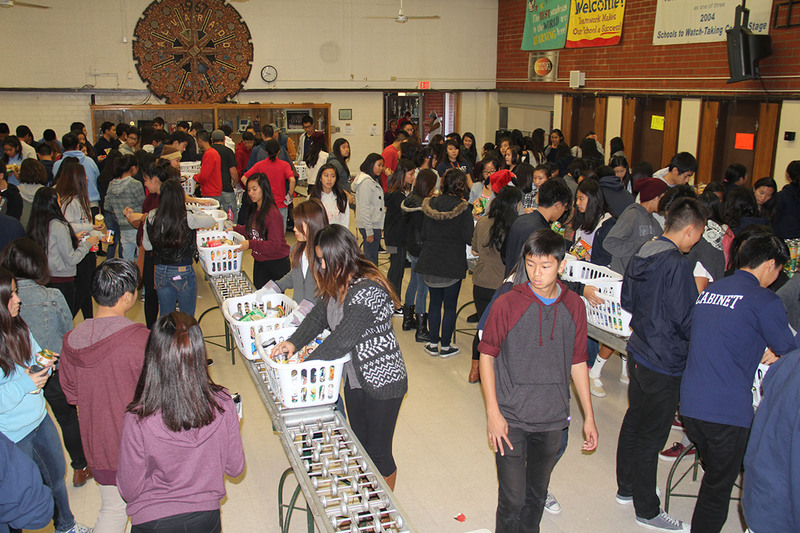 There were 320 holiday baskets assembled that families from across the Rowland Unified School District received. Mt. San Antonio College Board of Trustees elected Dr. David K. Hall as president, Judy Chen Haggerty as vice president, and Rosanne Bader as clerk. They will serve one-year terms, effective immediately. Dr. Hall is currently the longest-serving member of the Mt. SAC Board of Trustees. He was appointed to the Board in October 1995 after serving two terms as President of the Mt. SAC Foundation. He was later elected to four-year board terms in 1997, 2001, 2005, 2009, and most recently ran unopposed in 2013. He is Chairman of the Industry Manufacturers Council (IMC) Human Resources Committee, Vice President of the Regional Chamber of Commerce—San Gabriel Valley, Board Member of the San Gabriel Valley Civic Alliance, Board Member of the San Gabriel Valley YMCA, and Vice Chairman of the Oversight Board of the Successor Agency for both the Covina Redevelopment Agency and the San Dimas Redevelopment Agency. Professionally, Dr. Hall is Senior Vice President of Hitchcock Automotive Resources, which owns and operates auto dealerships throughout Southern California. Chen Haggerty was elected to the Board in 2001, 2005, 2009, and ran unopposed in 2013. She is the first Asian-American to serve on the board. She is a practicing attorney, law professor at Rio Hondo College, and the Law Area Chair for the University of Phoenix. At the state level, Chen Haggerty has served on the California Community College Trustee Officers Nominating Committee. She also represented Mt. SAC in the California Leadership Alliance for Student Success statewide project funded by the James Irvine Foundation and the William and Flora Hewlett Foundation. She currently is the co-chair of the Advisory Committee on Education Services of the Community College League of California, the Charles Kennedy Equity Awards Committee, and serves on the Evaluation Team of the Accrediting Commission for Community and Junior Colleges, Western Association of Schools and Colleges. During her 30 years of community service, she has been a founding director of the FORUS foundation (Rowland Unified School District), founding president of Rowland Chinese Association, executive board member for Mt. SAC Foundation, the Advisory Committee member of Mt. SAC Regional Health Occupations, Vice President of the Rowland Heights Community Coordinating Council, member of Walnut Valley Rotary Club, and 10-year board member of Presbyterian Intercommunity Hospital. Bader was elected to the Mt. SAC Board of Trustees in 2003 and reelected in 2007 and 2011. In 2007, Trustee Bader was elected to the California Community College Trustees Board, which makes recommendations about education policy issues pending before the state Board of Governors and the California Legislature. She is a member of the Board of Directors of Pomona Valley Hospital Medical Center and serves as a member of the hospital’s Foundation Board. She also presides over the Pomona Rotary Board. She spent 32 years in public education, both as a teacher and administrator. Before retiring from the Pomona Unified School District in 2001, she was principal at Diamond Point Elementary School in Diamond Bar and formerly served as principal of Allison Elementary School in Pomona. The other Mt. SAC trustees are outgoing president Fred Chyr, trustee Dr. Manuel Baca, trustee Laura Santos, trustee Robert Hidalgo, and student trustee Paola Mendoza. Chaparral Middle School in Walnut joined millions of students in over 180 countries to participate in “The Hour of Code.” This year, the non-profit Code.org teamed up with Disney Interactive on a tutorial that lets young programmers help Frozen sisters Anna and Elsa make ice fractals and skating patterns using basic coding skills. The Frozen tutorial will kick off the Hour of Code campaign designed to promote participation in computer science, especially among girls. Hour of Code launched 2013 in an effort to introduce students to computer science, demystify coding, and demonstrate that anyone can learn the “basics” of coding. Last year, Chaparral Cougars learned to code during this worldwide event and enjoyed engaging tutorials and lessons. Some students even started a “coding club” as a result of their experiences, which remains a viable club on the Chaparral Middle School campus! The school is excited about the problem-solving and logic building skills that the students will be developing this year as a result of “The Hour of Code”, and is confident that the lessons learned will build a foundation for their success in any 21stcentury career path that they may choose. 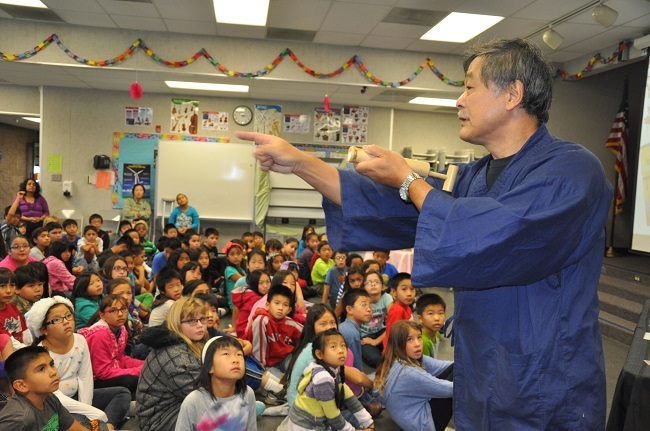 Children’s author Sunny Seki introduced his tales ofJapanese folklore to Walnut Elementary students during a visit on Dec. 5. Before Seki was a published author, he was busy telling stories to his nine children at bedtime. Over the years, as the stories multiplied and developed into slideshows, his wife Judy suggested that he write children’s books. The couple eventually closed a successful photography business so Seki could pursue his dream of becoming a full-time author illustrator. This idea for his first published book, The Tale of the Lucky Cat, was born when one of his children asked about the history of Japanese lucky cat. He couldn’t find any books on the subject, so he decided to write one. “I’m the first one!” he said proudly of the award-winning book that retells the ancient legend of the humble toymaker who remembers a rescued cat by creating clay statues of a cat with a raised paw. Seki enlisted the help of a few Walnut Elementary students during a pantomime of the story. His wife narrated the book and showed slides during the assembly. One student asked if he liked being an author. “I love it, so I can come see you guys!” Seki exclaimed. Another family was originally hired for the show, but they couldn’t act well in front of the camera. “So, you never know what good luck is waiting for you!” the author said. 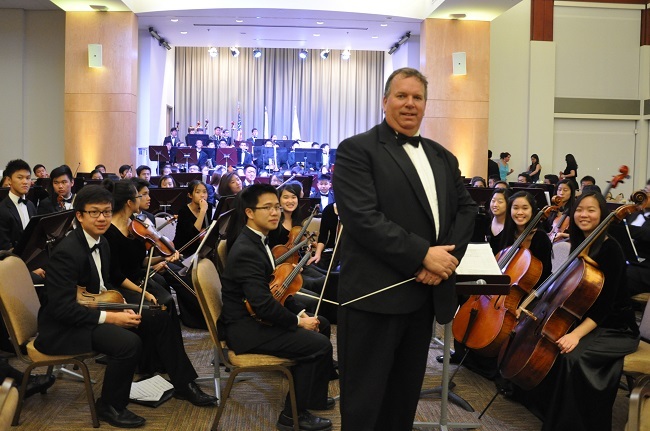 Diamond Bar High School Instrumental Music Director Steve Acciani has been named a finalist for the Grammy Music Educator Award. Ten teachers were selected from over 7,000 nominations around the country for their significant contributions to music education. Each finalist will receive $1,000 honorarium. “We are extremely proud of the recognition that Mr. Acciani has earned from the Grammy Foundation. He is an inspirational music teacher and an integral part of who we are as a community. We are so happy for him!” said Principal Catherine Real. This is Acciani’s 26th year teaching in the Walnut Valley Unified School District. “I feel so fortunate to live and work in a community that recognizes the importance of the arts for our students. The school district and community continues to provide fantastic support for our programs, allowing us to do some pretty amazing things,” Acciani said. While the Grammy ceremony is held to present artists with the recording industry’s most prestigious award, the Grammy Foundation and Recording Company will also honor one local hero. The winner will be announced during the 57th Annual Grammy Awards on Feb. 8. For the second year, the Grammy Music Educator Award will pay tribute to a special teacher for his/her remarkable impact on students. The winner will be flown to Los Angeles to accept the award, attend the Grammy Awards ceremony, and receive a $10,000 honorarium. On Nov. 11, Grammy honorary chairman and “American Idol” host Ryan Seacrest visited Diamond Bar High to congratulate Acciani on being named one of the 25 semifinalists for the award. Diamond Bar High was named the 2014 National Grammy Signature School becoming the first high school in California to receive the prestigious award.